Engine Timing Belt Kit-w/Water Pump & Seals DAYCO WP245K5AS. Country of Origin (Primary) : TH. Harmonized Tariff Code (Schedule B) : 8413309000. Also review the notes section in the compatibility chart for additional specifications about this part. This part generally fits Chrysler, Dodge, Plymouth vehicles and includes models such as Neon with the trims of ACR Coupe 2-Door, ACR Sedan 4-Door, Base Sedan 4-Door, ES Sedan 4-Door, High Line Coupe 2-Door, High Line Sedan 4-Door, LX Sedan 4-Door, SE Sedan 4-Door, Sport Coupe 2-Door, Sport Sedan 4-Door, Style Sedan 4-Door. The engine types may include 2.0L 1996CC 122Cu. L4 GAS SOHC Naturally Aspirated. This part fits vehicles made in the following years 1999, 2000, 2001. Actual products may differ in appearance and contents. Portions of the part information on this page have been provided by WHI Solutions, Inc. 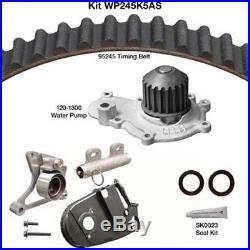 The item "Engine Timing Belt Kit-withWater Pump & Seals DAYCO WP245K5AS" is in sale since Thursday, June 15, 2017. This item is in the category "Automotive\Parts & Accessories\Car & Truck Parts\Engines & Components\Timing Components". The seller is "buyautopartscanada" and is located in Saskatoon, Saskatchewan.